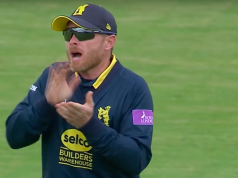 Northamptonshire opened up a clear gap at the top of the NatWest T20 Blast North group, as they mauled the Birmingham Bears by eight wickets in the first v second clash; Richard Gleeson’s new ball burst laying the platform for a dominant Steelbacks display. Gleeson was the chief destroyer, taking three wickets in his opening two overs as the Bears slipped to 25-5, a position from which they never recovered. Ateeq Javid’s 34 was the only score of note as they limped to 85-8, in a match reduced to 16 overs per side. Northants then made light work of their target, Josh Cobb continuing his excellent run of form with an unbeaten 39. The visitors romped home with 21 balls to spare, sealing a sixth win from seven completed games in the Blast. With 13 points from eight games with six games still to play, the Steelbacks are already on the verge of a place in the last eight. A home quarter final, which would prove a crucial financial boost for the cash strapped county, is also within their grasp. 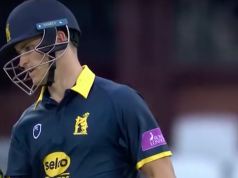 The match may have been billed as a top of the table clash but, instead of a closely fought contest, Northants dominated from start to finish, after a start that had echoes of last year’s semi-final clash between these two sides. On that occasion three wickets from David Willey left the Bears 14-4 inside four overs, stunning the home crowd on finals day and, although the crowd was significantly smaller and hampered by afternoon showers that reduced the contest to 16 overs, those inside couldn’t help but feel a sense of déjà vu. This time it was Gleeson doing the damage. The 28-year-old is turning into the breakthrough player of the T20 Blast this year. Playing just his fourth match, he followed his three wickets against Leicestershire last time out with a remarkable spell of 4-0-12-3. His third delivery, the ninth of the inning, saw Sam Hain beaten for pace as an attempted pull looped to cover, and two balls later Gleeson broke through the defences of Ian Bell. The Northants fielders also got in on the act, Richard Levi taking a stunning one handed slip catch as Laurie Evans drove at Ashraf, before Gleeson returned to have Luke Ronchi, playing the last match of his stint at Edgbaston, also taken by Levi, this time a regulation take at slip. That left the home side with 19-4 from four overs and it got worse, as William Porterfield drove Muhammed Azharullah’s first ball to cover. Even a quick shower couldn’t prevent what was turning into a slaughter of the Bears batting line-up, as the spinners played their part. After making 14 Rikki Clarke decided on the all or nothing approach and got nothing, as he was bowled charging Graeme White’s first ball. Mark Adair was bowled by Josh Cobb in the following over in similar fashion. Javid was the only batsman to make an impression at all, hitting Azharullah for consecutive boundaries, two of only six hit in the entire innings, but there was no support. Jeetan Patel was stumped off White, Clarke’s 14 the only other man to make it out of double figures. With 16 overs to chase, less than a run a ball, Northants lost Adam Rossington in the third over, chipping Clarke to cover, and things could have been different had Cobb not been badly dropped with only a single to his name, Patel failing to hold onto a high catch at cover. Instead Cobb led the run chase, as he had against Leicestershire last Sunday. His made third half century in four T20 innings and only the small target prevented another being recorded. Richard Levi fell for 14 off Adair’s first delivery, but it wouldn’t stop the run chase turning into a procession. Cobb and Duckett knocked off the remaining runs with an ease that had the punters in the Eric Hollies stand heading for the exits from the mid-way point of the innings. Cobb hit six boundaries in all whilst Duckett showed his invention, twice reverse sweeping the spinners. He finished 24 not out, leaving Cobb to finish the top in the 13th over, with 21 deliveries spare, a huge margin given the reduced length of match. MOTM: Richard Gleeson is turning into an unlikely hero for Northants in the t20 Blast this season, grabbing his chance due to injuries to others with both hands. The 28 year old enjoying a belated flying start to his county career and his three wickets in 12 balls, on the way to figures of 4-0-12-3, sparked the early collapse that the Bears never recovered from.